Microsoft and Red Hat compete in a growing number of markets — from operating systems to virtualization to various cloud services. Microsoft claims its public cloud, Windows Azure, supports open standards. Red Hat claims its own hybrid cloud platforms — CloudForms, OpenShift, etc. — deliver truly open approaches to cloud computing. But so far I think the Microsoft and Red Hat cloud strategies are missing a key component — each other. And at some point, I predict, they will overcome their competitive posturing to build a closer cloud relationship. The reason: Customers and partners will demand it. To Microsoft’s credit, the company offers SUSE, OpenSUSE, Ubuntu and CertOS in the Windows Azure cloud. That’s a nice start. But customers want to run Windows and Red Hat Enterprise Linux (RHEL) side by side on physical, virtual and cloud systems. Microsoft Hyper-V in the cloud needs to run RHEL. And Red Hat Enterprise Virtualization (RHEV) in the cloud needs to run Windows Server. Much of that work already exists. Red Hat and Microsoft partnered in 2009 to cross-certify their virtualization and operating system efforts. But that three-year-old partnership needs updated statements from both companies. How are they working together today? And how will that work benefit partners and customers? 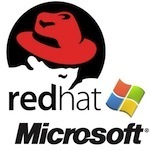 I didn’t hear any major Red Hat-Microsoft chatter from last week’s Red Hat Summit in Boston. But I’ll ask for updates during the Microsoft Worldwide Partner Conference 2012 (WPC12) next week in Toronto.